I like words. God’s Word is my favorite. I’ve been reading Ephesians and a word jumped out at me. A simple word, but I looked it up in the Greek, ‘cuz that’s what I like to do–dig a little deeper, find out what the writer meant versus what the translator thought he meant. I continued looking into this word. It is used 15 times in the book of Ephesians. Nine of those times it is translated saints. The other six times it is translated holy. Two of those times it is used to refer to the Holy Spirit. Again, according to BibleHub.com it occurs in the New Testament 235 times. Almost all of those are translated holy. All four holies in these two Scriptures are hagios–set apart, sacred. God calls us to be set apart, holy, sacred, and different from the world. If He has called us, He has equipped us. We, as Christians, are modern day saints–the holy ones set apart by Him for Him. 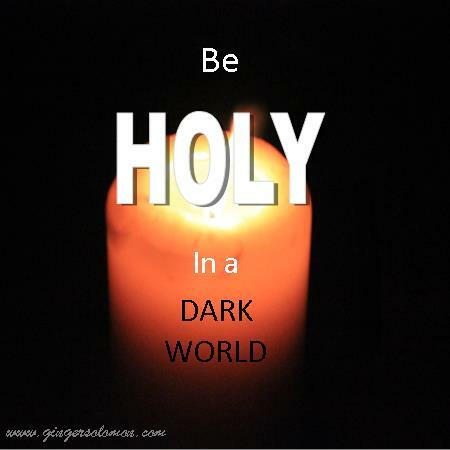 We are to be different from the world because we are to be like the Lord–holy, blameless, and without blemish. So many people would disagree that we can’t be Holy, that we just can’t measure up. But God doesn’t tell us we can do something or call us to be something He destined us to fail in. We can live a Holy life! We may not be perfect, we may fail in moments of weakness, but it how short the distance between that failure and repentance that measures our maturity. I don’t wake up and say, ” how can I fail you today?” I wake up and say, “how can I please and serve you, Lord!” Holiness may be measured in our response to Him, but it’s also measure in our willingness to respond as well. Merry Christmas my friend! I agree completely, Stacy. Thanks for commenting.